We have created this summary of the different types of assessment that can be used for measuring development in reading skills in the hopes that teachers will better understand how single skills can be assessed by multiple measures. This description of the various assessment techniques may also help teachers to design their own classroom assessments, and may help teachers to better understand the district or campus assessments that are already being used with their students. Each of the elements of the framework is briefly described, and descriptions of various forms of assessments that could be used for that framework element are provided. Reading comprehension assessments are the most common type of published reading test that is available. The most common reading comprehension assessment involves asking a child to read a passage of text that is leveled appropriately for the child, and then asking some explicit, detailed questions about the content of the text (often these are called IRIs). There are some variations on reading comprehension assessments, however. For example, instead of explicit questions about facts directly presented in the text, the child could be asked to answer inferential questions about information which was implied by the text, or the childs comprehension might be tested by his or her ability to retell the story in the childs own words or to summarize the main idea or the moral of the story. Another common reading comprehension assessment is called a "cloze" task  words are omitted from the passage, and the child is asked to fill in the blanks with appropriate words. Also, young childrens reading comprehension can be assessed by asking them to read and follow simple instructions, such as, "Stand up" or, "Go look out the window." Reading comprehension should not be confused with reading accuracy, another very common form of reading assessment. In a reading accuracy assessment, a child is asked to read a passage of text clearly, without making any mistakes. The mistakes that the child does make are analyzed to find clues about the childs decoding strategies (not comprehension strategies). Very often, an assessment combines these two different assessments into one assessment  the child reads a passage out loud while the teacher makes note of errors the child makes (sometimes called a "running record"), and then the child is asked some comprehension questions about the passage. However, it is worth noting that a beginning readers comprehension usually suffers when he or she is asked to read a passage of text out loud. When children read orally, they usually concentrate on reading accurately, and do not pay as much attention to comprehension of the content. Oral reading accuracy does give insights into decoding skills and strategies, but that is a separate test. A reading comprehension test is most accurate if the child is not reading for an audience. Find published reading assessments that test Reading Comprehension. Because comprehension is what is being measured, language comprehension can be assessed in basically the same way reading comprehension is assessed. With language comprehension assessment, however, the child should not be expected to read any text. Everything from the instructions to the comprehension questions should be presented verbally to the child. It is also worth noting that a childs listening comprehension "level" is usually considerably higher than her reading comprehension "level." A child that is not able to read and understand a passage of text usually has no difficulty understanding the text if somebody else reads it to her. For most young children learning to read, their ability to read and understand text is limited by their decoding skills, not by their comprehension skills (That is not to say that most children have "good" comprehension skills or that comprehension skills are not a reading teachers concern. The point here is that even when a childs comprehension skills are poor, their decoding skills are usually worse.). However, sometimes teachers find that a child who can not read and understand a passage of text also does not understand it when the teacher reads it to the child. It is always worthwhile to compare a childs language comprehension with her reading comprehension to be sure that her ability to understand text is not being limited by her ability to understand language. Find published reading assessments that test Language Comprehension. As mentioned earlier, oral reading accuracy is one form of decoding assessment, but it is not a very "clean" assessment. Teachers need to be aware that, in their early attempts to acquire reading skills, children apply many different strategies, some of which are hard to detect. Children often attempt to guess words based on the context or on clues provided by pictures  most of the time, a childs guesses are inaccurate, and their difficulties with decoding are revealed, but sometimes the child guesses correctly, making the teacher believe that the child accurately decoded the word. Teachers who use oral reading as a decoding assessment need to pay careful attention to the child as they read, and need to be aware that the child may know some words because those words are in the childs sight-vocabulary, and the child may know other words because she is guessing. 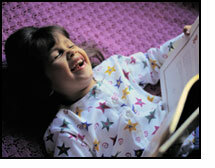 Typically, decoding skill is measured through the childs ability to read words out of context. Isolated words are presented to the child one at a time, and the child is asked to say the word aloud (this is not a vocabulary test, so children should not be expected to provide meanings for the word). The words selected for a decoding test should be words that are within the childs spoken vocabulary, and should contain a mix of phonetically regular and phonetically irregular words. A child can be tested on their accuracy (Is each word pronounced correctly? ), their fluency (How much does the child struggle with word naming? ), or their "level"  Leveled lists of words are provided by many publishers, and the child can be assessed as to her ability to decode words that are of varying difficulties. Sometimes teachers test childrens ability to "recognize" sight words as a test of decoding skill, but "recognizing" words is not the same as decoding them. Decoding is a strategy that readers can use on all words, even words theyve never seen before. Sight-word reading has to do with memorizing the "image" of a word or a specific feature of a word, and with this strategy, only a select few words are learned. All children go through a stage as they learn to read where they memorize a few sight words, and sometimes they are even encouraged by teachers who use Dolch word lists and frequency indexes to focus the childs attention on the most useful sight words. However, memorizing sight words does not help a child to learn how to decode words, and testing the childs knowledge of specific, well-practiced sight words does not provide a measure of her decoding skill. Find published reading assessments that test Decoding. There are many assessments on the market that measure a childs general knowledge of facts about the world. Usually some estimation is made of what one could reasonably expect children in the first grade to know (e.g. birds build nests in trees, or bicycles have two wheels), and the child is asked to answer these simple "fact" questions (similar to what would be found on the old intelligence tests). However, the assessment we are suggesting is a measure of the childs relevant background knowledge, and by "relevant" we mean "related to the task at hand." For example, if a child is expected to listen to and understand the story Charlottes Web, the child should have some background knowledge about farm animals and spiders. Children know a lot of things; children raised in the city know about public transit, taxis, traffic jams, shopping malls, and sky scrapers. Children raised in other settings know about other things. A particular child may not know much about a particular topic, and it is worthwhile to assess a childs relevant background knowledge before expecting a child to be able to accomplish a task. Find published reading assessments that test Relevant Background Knowledge. Linguistic Knowledge is the synthesis of three more basic cognitive elements -- phonology, semantics, and syntax. Linguistic knowledge is more than the sum of its parts, but it does not lend itself to explicit assessment. A child may have a grasp on the more basic cognitive elements, but still have trouble blending these elements together into a stable linguistic structure. If a child appears to have a grasp of the more basic cognitive elements, but is still having difficulty expressing themselves or understanding others, it is likely that the child has not yet managed to synthesize those elements. Find published reading assessments that test Linguistic Knowledge. In a phonology test, the pairs of words do not have to be real words the child is familiar with. If a teacher wishes to make up a phonology test, she might find it easier to use made-up words. There is some merit to this approach because the childs attention is focused on the words themselves, and not on the meanings of the words. Find published reading assessments that test Phonology. Although the items should not involve printed text, it is very common to use pictures in semantics assessments. A child might be asked to provide a name for pictures as a test of expressive vocabulary, or to match spoken words with pictures as a test of receptive vocabulary. A test of semantics at the larger-than-word level may involve asking a child to arrange a series of pictures to reflect a logical sequence of events. Another common assessment involves asking a child to provide a word that best matches a definition presented (verbally) by the teacher as a test of expressive vocabulary, or to ask a child to provide a definition to a word as a test of receptive vocabulary. Similarly, a test of vocabulary knowledge could require that the child be familiar with several words in order to answer each item correctly. For example, the child could be asked to select a word which does not belong in a group of words (e.g. THREAD, STRING, ROPE, KNOT). In this sort of assessment, the child must know the meaning of most if not all of the words in each item in order to be successful. Similarly, a child might be asked to provide a synonym or an antonym for words, which is a test of both receptive and expressive vocabulary. Again, in this case, more than one vocabulary word is being tested at a time  the child must know the meaning of the test item, and must know a word which either has the same meaning or an opposite meaning. Morphology assessments often involve asking a child to describe how a words meaning changes as parts of the words are changed. For example, a child could be asked to break compound words into their component parts and to describe the meaning of those component parts (e.g. DAY-BREAK, BASE-BALL, HEAD-ACHE). Or, a child could be asked to describe what happens when affixes are added to words (as in SKIP versus SKIPPED) and to explain those affixes (What do UNWRAP and UNTIE have in common?). Similarly, a childs appreciation of morphology can be assessed by asking the child to describe how words with similar parts are related (e.g. EARACHE, EARRING, EARDRUM). Semantics assessments at the larger-than-word level usually depend on identifying words or sentences that do not make sense in the context (e.g. "Billy had a dog. He loved his dog. His fish was orange. His dog could fetch a ball. "), or they depend on the child identifying logical inconsistencies (e.g. "Billys dog could fetch and he could roll over. He was a good dog, but he didnt know any tricks."). Find published reading assessments that test Vocabulary. It is difficult to assess a childs syntactic knowledge without using printed text, but as was the case with semantics, if the child must process text to take the test, then the test becomes more of a decoding skills test than a test of syntax. It is possible to make some estimations about the childs productive syntactic knowledge by listening to the sentences that the child forms when he or she is talking. Further, a child can be asked to identify sentences (spoken) that are syntactically incorrect (e.g. Jane and her dog the hill they climbed it. ), and additionally, the child can be asked to restructure the sentence correctly. Another assessment of syntax that could be used involves the childs ability to combine simple sentences into complex sentences, and to add modifiers appropriately. So for example, "Brownies taste good" could be combined with, "Mary likes to eat brownies" to make the complex sentence, "Mary likes to eat brownies because they taste good." Similarly, children could be asked to appropriately insert the words, "brown" "big" and "quickly" into the sentence, "The spider ran up the wall" to make a more complex sentence such as "The big, brown spider quickly ran up the wall." Similarly, a childs syntax can be assessed through a test of their ability to change tense and modifiers of sentences. A child could be asked to restructure, "I went to the store" to the future tense. Find published reading assessments that test Syntax. The best test of the childs ability to sound out regular words is to ask them to name isolated (out of context) words that they are not familiar with. This insures that they are decoding them, and not just recognizing them or guessing based on contextual cues. Some tests simply use real, regular words that are so rare that it is unlikely that the words are familiar to the child (e.g. PUN, MOCK, LOOT), but some tests use invented or made-up words (called pseudowords) to insure that the child does not have any prior experience with the test items (e.g. PARD, ORT, SERT). Some tests attempt to make the task more authentic by asking the child to read aloud a list of peoples names (to pretend they are "calling roll"). The names are spelled phonetically and are not difficult to pronounce (e.g. WANDA BOLTON, WILLIAM BECKER, VICTOR CONRAD). Find published reading assessments that test Cipher Knowledge. First a child learns to sound out words; then the child learns that when certain words are sounded out, they do not make sense. As we grow, and as we are exposed to more and more text, we learn new irregular words. As a child, you learned words like ONE, SHOE, and PEOPLE. As you read more, you learned words like CHOIR, COLONEL and ISLAND. Later still, you learned words like GEYSER, FEIGN, and BUREAU, and if you dont already know them, in the future, you may learn such words as SYNECDOCHE, BAREGE, and CACHET. In short, a persons ability to correctly read irregular words is directly related to their exposure to those words combined with information about the correct pronunciation (It is not uncommon for people to have read a word dozens of times, to know the meaning of that word, but to not know its correct pronunciation.). Whereas a test of regular word reading is strengthened by using words that the child is not familiar with, any test of irregular word reading should use words that one could reasonably expect the child to be familiar with. This can be accomplished using leveled word lists, or by using words from previous vocabulary lessons, or from the leveled texts that the children are reading from. Once the words are chosen for an appropriate test of irregular word reading, the test can take one of several formats. The child can be asked to simply read the words aloud, or the child could be asked to find a word from a set that does not belong with the others (e.g. LINT, MINT, PINT). Similarly, the test might ask the student to find a rhyme for each regular word from a set (e.g. find the word that rhymes with CHOIR  CHAIR, CHORE, WIRE). Also, a test of irregular word reading could ask children to match pairs of words that have the same letter sounds (e.g. REIGN, SIGN, MINE). Find published reading assessments that test Reading Irregular Words. Specifically, phonological awareness tests are tests which reflect the child's knowledge that words are made up of sounds (linguists call this a "metalinguistic" skill), while phoneme awareness tests are tests which reflect the child's specific knowledge that words are made up of phonemes. Children's awareness of the fact that words are made up of sounds can also be assessed through word length comparisons - a child is (verbally) presented with two words, and is asked to determine which word is longer. This assessment is especially effective for young children if the phonemes of one word are contained within the second word (e.g. KING and KINGDOM or PIE and SPY - note that PIE and SPY have the same number of letters, but SPY has more phonemes.). To test phoneme awareness, segmentation and blending techniques can also be used, but in a phoneme awareness task, the pauses would be inserted after each phoneme (either when the teacher segments the word or when the student segments the word). So in a phoneme segmentation task, a pause is inserted after each phoneme (/sat/ � /s/ /a/ /t/), and in a phoneme blending task, a segmented word is blended together to make a whole word (/s/ /a/ /t/ � /sat/). In addition to phoneme segmentation or blending tasks, there are several other phoneme awareness tasks can be used to show that the child is aware of all of the phonemes in spoken words. For example, a child can be asked to count the number of phonemes in a word (e.g. how many phonemes are in the word PIN? ), or a child may be asked to delete a phoneme from a word (e.g. What would PIN be if you took out the /p/ sound? ), or add a phoneme (Add an /s/ sound to the beginning of PIN), or substitute a phoneme (replace the /i/ in PIN with an /a/ sound). Also, children can be asked to rearrange the sounds in a word (move the first sound of SIT to the end - Note, children who have been taught "Pig Latin" are particularly good at this task.). Finally, children clearly have phoneme awareness if they are able to identify a phoneme in different words. Children should know that the words SAT and TOP both contain the /t/ sound, and that GAME and PLAY both contain the /a/ sound. It is worth mentioning that some of these phoneme and phonological awareness tasks are harder than others. Blending is easiest, but can be made more difficult if the word, when blended together, does not form a word that the child is familiar with (e.g. SAZ or VIKE). Segmentation is more difficult than blending, and becomes considerably more difficult if the word to be segmented contains consonant clusters (sometimes called digraphs -- e.g. MASK, SPIN or SLIP). Phoneme addition, deletion and manipulation, the most difficult tasks, are also made more difficult by creating words the child is unfamiliar with, and by adding consonant clusters. Find published reading assessments that test Phonological/Phoneme Awareness. A childs understanding of the alphabetic principle can be assessed very early, even before the child can read or write simple words. The most direct approach is to ask the child to write words that you dictate  even if the child can not write the words accurately, her understanding of the alphabetic principle is revealed by whether or not she writes one symbol for each sound in the word. Young children often represent a whole word with a single symbol (Sometimes the symbol the child chooses is the first letter of the word, so a child might represent the word DOG with the letter D). This reflects their view that a word only exists as a representation of an object. Children who have an understanding of the alphabetic principle, however, will attempt to encode all of the sounds they hear in the word, although they may not use the right letters  in fact, they may not use letters at all. The child who has internalized the alphabetic principle may write the word BALL with three symbols, and ironically may represent the word BOX with four symbols (e.g. BOKS). Similarly, a childs knowledge of the alphabetic principle can be tested in other ways. Children can be presented with two words (written)  one long word and one short word. The teacher asks the child to pick the word they think she is saying (and she would say either a very long word or a very short word; e.g. HAT or HIPPOPOTOMOUS. The words can get closer in length as the child learns the object of the assessment.). Even if the child can not read yet, an understanding of the alphabetic principle will allow her to pick the right word. Find published reading assessments that test Knowledge of Alphabetic Principle. Typically, testing a childs knowledge of the letters of the alphabet involves presenting the child with a page full of letters, and asking the child to name them. The page usually contains upper-case letters and lower-case letters, and a few odd characters like the two versions of the lower case "a" and the lower-case "g". This is not, however, the only approach to assessing letter knowledge. Young children who do not know the letter names yet can be given a pile of manipulable letters and numbers and symbols and asked to separate the letters from the numbers and symbols. Similarly, children can be asked to "tell what they know" about each letter  they may not know the name of the letter, but they might know a sound that it represents or a word that starts with that letter. Children that know all the letter names can be further tested by their ability to separate the letters into upper- and lower-case groups, or to separate them into vowels and consonants. Find published reading assessments that test Letter Knowledge. Again, a childs writing is a good way to reveal their understanding of the mechanics of text. Even children that are not writing well-formed letters can reveal what they know about print  very young children who have some experience with text "write" starting at the top, left corner of the page, writing in parallel, horizontal lines from left to right, and from the top of the page to the bottom of the page. The "words" the child forms are separated by spaces, and may even contain letter-like symbols. Sometimes children even insert some attempts at punctuation into their creations. A teacher can also observe how the child handles a book, and can assess the childs knowledge about how information is presented in the book. A teacher can determine the childs general knowledge of books (Does the child know where the cover is? Does the child hold the book right-side-up? Does the child turn the pages appropriately? Does the child know that the message of the book is contained in the text? ), and the teacher can gather knowledge about more specific details (Does the child have one-to-one correspondence between printed words and spoken words? Does the child know what a sentence is and what punctuation is? Can the child identify capital letters and lower-case letters?). Find published reading assessments that test Concepts About Print.